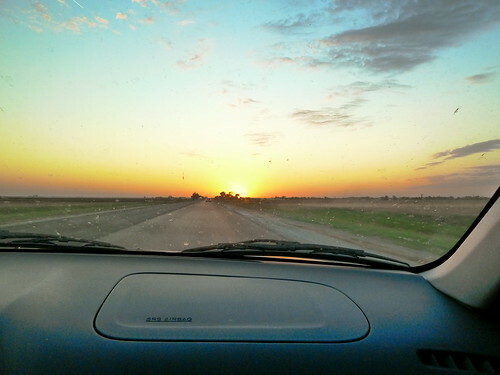 A few weekends ago I took a one day road trip to Keokuk, IA as the passenger of a Mazda Protege which had been in its owner's possession for exactly nine days. Sometime around 8:30 pm, maybe five miles east of Quincy, IL, a deer stepped out in front of us. We swerved, it ran forward and we collided. The deer hit the hood, some car parts and possibly deer parts exploded and then the entire deer bounced off the car over the driver's side. We kept going. It's so weird how mellow the whole event was. We drove for a good 30 minutes or longer before the car started steaming and overheating. We made it to to an exit and the car died as we approached the top of the exit ramp, but we were able to coast into a gas station where we waited for a family member to come get us. And then we rode home, arriving later than expected. But what about the deer?